← Hilary to Participate In Her Second 10K! 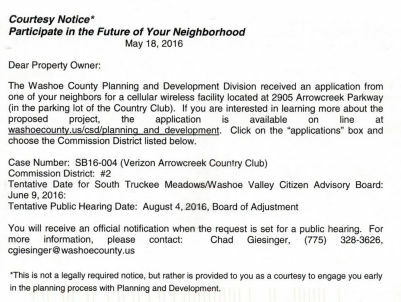 The discussion is now on the June 9 South Truckee Meadows/Washoe Valley Citizen Advisory Board (CAB) agenda. The CAB meeting starts at 6 PM in the South Valleys Library. The Board of Adjustment hearing is now tentatively scheduled for August 4, 2016. It will be up to individual owners to go to the county meetings to voice any pro or con statements. For more info, see our April 30 post. This entry was posted in ACHOA, ArrowCreek, ArrowCreek 411, ArrowCreek HOA, ArrowCreek411, Cell Tower, The Club at ArrowCreek and tagged ACHOA, ACHOA Board, ACHOA BOD, ArrowCreek, ArrowCreek 411, ArrowCreek Cell Tower, ArrowCreek411, Cell Tower Pine Tree, Non-Residential Area, Non-Residential Property, TCAAC, TCAC, The Club at ArrowCreek. Bookmark the permalink.